Nashville, TN. and McLean, VA., September 26, 2016 — Corcentric™, a provider of cloud-based financial process automation solutions, today announces the launch of its newest product, an e-payments solution to help its customers further automate and digitize their payments processes. This integrated, end-to-end solution automates back-end accounts payable and payment transactions, processes all of a company’s disbursements, dramatically reduces accounts payable and payment costs and efficiently manages the cost of growth. Corcentric manages all forms of payment – ACH, paper check and credit cards. Corcentric’s new e-payments solution, announced today from the TMW Systems in.sight User Conference + Expo 2016 in Nashville, Tenn., seamlessly handles vendor payments by obtaining a simple payment file from the client, which is then allocated and directed towards its vendors. Corcentric handles all vendor management and supplies confirmation of payments in an easy-to-use file. Using paper checks is still a prevalent practice for B2B payments, and combining the costs for both incoming and outgoing check payments, organizations that process in excess of 20,000 checks per month may see total transaction costs for checks in the neighborhood of $1 million per year, according to the 2015 AFP Payments Cost Benchmarking Survey. With figures that high, there is an opportunity to substantially decrease costs by migrating away from checks to e-payments. 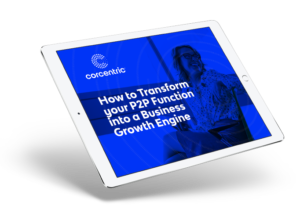 By partnering with Corcentric, finance departments will benefit from fully automating their accounts payable processes and digitally managing invoices and purchase orders through to the “last mile of a transaction” – payment. The integration opportunities that e-payments offers eliminates the time consuming, error-prone, inefficient paper-based manual processes organizations rely on today. Corcentric partnered with FIS and Comdata to create this integrated payments solution. FIS’s PayNetExchange payment solution provides an automated payment processor initiating ACH, Check and Virtual Credit Card payments. This system also makes it easier for clients to check payment status, approve payments and run reports. It also includes a vendor portal to manage payment preferences, view payment history and access remittance information. Comdata will supply the Virtual Credit Cards and has been a pioneer in the creation and market adoption of virtual credit cards for B2B payments. The company’s system enables market-leading controls and supplier acceptance, allowing Comdata to become the second largest commercial issuer of MasterCard in North America. Attendees at the in.sight conference can discuss their payments needs with Corcentric experts and obtain a free spend analysis by visiting booth 206 at any time during exhibition expo hours. To learn more about Corcentric’s new E-payments solution, please visit www.corcentric.com/ap-automation/electronic-payment-solution. Since 1969, Comdata has been a leading provider of innovative B2B payment and operating technology. By combining our unique capabilities in technology development, credit card issuing, transaction processing and network ownership, we help our clients build electronic payment programs that positively impact their bottom line and operate their businesses more efficiently. Comdata is part of one of the largest payment companies in the world and is the second largest commercial issuer of MasterCard in North America. Our 5,300 employees partner with companies in 51 countries to manage more than 1.9 billion fleet, corporate purchasing, payroll and healthcare transactions each year. Corcentric, a wholly-owned subsidiary of AmeriQuest Business Services, LLC, provides cloud-based financial process automation solutions that have revolutionized how the world’s largest organizations manage and protect their financial assets. By connecting best practices with deep expertise, Corcentric’s Accounts Payable and Accounts Receivable automation solutions enable organizations to reduce costs, streamline processes, and provide unmatched visibility executives need to make critical business decisions. For more information, visit corcentric.com. Corcentric Completes Acquisition of Determine, Inc.